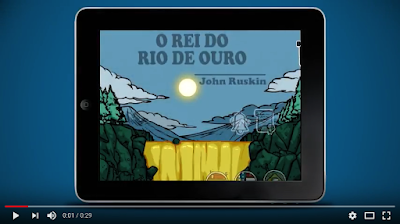 ”Golden River" is a free interactive digital book that shows how biology can solve the great challenges of the planet (translated to English, Spanish, and Portuguese). You can learn more about the United Nations Sustainable Development Goals, experiment science activities, reflection and social action recommended by experienced teachers and scientists. ”Golden River" is a short story written as a fairy tale. It tells the story of a very old and strange man who visited three brothers during a thunderstorm. Unfortunately, two of them mistreated the old man who was, in fact, the “South-West Wind Esquire”. To take revenge, he turned their fertile valley into red sand. The engaging narrative, full of interactivity and sound effects that give life to the story, invites the young public to reflect on the SDG #6 (water and sanitation). “Golden River” app book playfully teaches how biology is essential to guarantee the access to health water around the world. This book app is available for free on iOS and Android (smartphones/tablets). Watch the video below to learn more about 'Golden River'. By Stefany Freitas, Communication and MKT – StoryMax.